Before your site can convert, it needs to be found. It’s more than search. It’s sales. What good is a website if nobody can find it? To get your site in front of prospects, it needs to be visible in search engines. 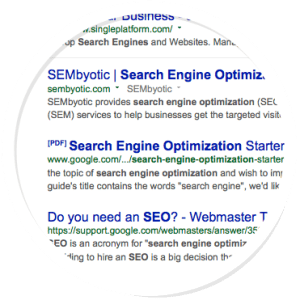 SEMbyotic provides search engine optimization (SEO) services to businesses looking to increase demand generation and fill their sales funnels. A customer’s sales journey often starts with a web search. Since your site can’t convert sales if it can’t be found, you need a clear, concise description of what you offer embedded within your site’s organic search efforts; otherwise, prospects move on. Just as you wouldn’t stop selling, your customers won’t stop searching, so think of internet marketing as essential to your long term sales objectives. Search has evolved, but keywords still matter. SEO (also known as natural, earned, or organic search engine optimization) involves achieving higher (non-paid) rankings within search engines like Google and Bing. Your site won’t optimize itself — even if it has built-in search optimization tools. You must make a deliberate effort to rank in search engines through keywords, title tags, and links pointing to your site (inbound links). Search engine optimization is a noisy, crowded industry. It can be challenging to separate the SEO experts from amateurs. If a company guarantees a page 1 ranking, that should raise a red flag. How can anyone promise placement on a platform whose algorithm is a closely-guarded secret? The terms SEO and SEM are not interchangeable. SEM covers the entire spectrum of search marketing, such as outreach activities, paid search, and non-paid organic search techniques. In the early days, SEO was primarily focused on what could be controlled on your own site. Internet marketers did things like stuffing their pages full of keywords. Those who had the most keywords ranked higher, but prospects would click on a search result only to find a page filled with nonsense. Search engines have since evolved, detecting legitimate content from content written purely to drive organic search rankings. Your site content and inbound links now determine relevance. That means digital marketers need to find ways to earn links back to their own sites through inbound marketing. Since SEO is no longer just about what you do on your own site, the term SEM was born. Unlike other digital marketing companies, we know a hybrid of non-paid search engine optimization and paid search advertising is the best approach to SEM. We help you rank for terms that give you the best opportunity to reach your target audience. And here’s why we don’t offer service packages: Each website and situation is unique. Imagine taking the same approach to ranking a detailed phrase like “San Jose SEO” versus something more broad such as “SEO.” There will be much more competition for the latter term. Dropping the phrase “San Jose” from the search query opens the site up to national or global competition rather than local. Applying the same packaged approach to both situations wouldn’t be appropriate. Instead, we tailor our services to the needs of our customers. Keyword Research: Choosing the right keywords is the foundation for next steps. Onsite Optimizations: Making sure your site is technically optimized for search engines. Strategic SEO: Are you going after the right keywords? Content Strategy: Do you have a plan to generate the right kind of content? Content Amplification: Maximize the impact of your content development efforts. Website Audits: Is your site in good working order for both search engines and humans? Competitive Research: What are your competitors doing online? Measurement and Analysis: How is your site performing? What should happen next? Link Building and Outreach: Are the right sites linking to yours? Are you generating shareable content? Paid Search Marketing: Are you buying the right keywords? Is your PPC or paid search advertising optimized to give you the best ROI? Social Media Marketing: Are you promoting your content to the right audience? Is it being shared? Online Marketing Strategy: Do you know your audience and where they go for information? It’s time to get the right traffic with organic search engine optimization. We looked at the data and saw a number of people searching for a “san jose seo expert”. To be honest, we get a little skeptical of any consultant that considers themselves an “SEO expert”. Search is a constantly changing, ever evolving field. There is always something to learn when it comes to SEO, and actual experts rarely refer to themselves as experts. When you hire SEMbyotic to manage your SEO program, you’re going to get a team of experienced professionals that stay current with the latest news and trends in internet marketing. We’ll promise to provide you with our best advice to achieve your goals within your budget. We’re in it for the long-haul, and we’re looking for long-term customers. Ultimately, the best results will come from a mutual relationship built on trust. Our commitment to you is that we’ll operate honestly, ethically, and with transparency. SEMbyotic: A San Jose SEO firm providing organic SEO services to Silicon Valley companies. Serving San Francisco Bay Area companies since 2002. In this picture: Plaza de César Chávez, downtown San Jose, California.